14K White Gold 1/4 Carat Diamond Hammered Wedding Band Ring set with quality, white diamonds flush in the center of the band. Brushed Center Finish with polished edges. Available in your choice of H-J Color, SI Clarity Diamonds. 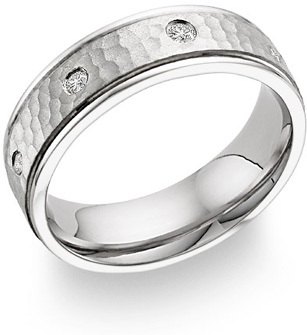 We guarantee our Diamond Hammered Wedding Band, 14K White Gold to be high quality, authentic jewelry, as described above.